Published by Sonoma Technology, Inc. The Sacramento Region Air Quality App is brought to you by the Sacramento Metropolitan Air Quality Management District, El Dorado County AQMD, Placer County APCD and Yolo-Solano AQMD. Visit www.SpareTheAir.com for information on air quality in the region and the Spare The Air program. Just because the sky is blue doesn't mean the air is healthy. 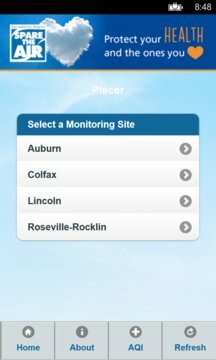 This app gives you the daily air quality forecast by air district area, current air pollution conditions at monitoring sites in the region, Check Before You Burn status for Sacramento County from November - February, Spare The Air alerts and wildfire smoke advisories.